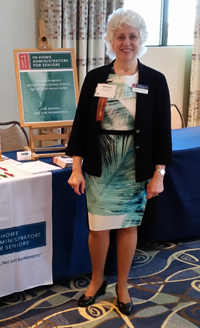 Rebecca Eddy, busy Business Owner of Eddy and Schein -firm that helps the elderly- looking great at a Conference. My client, a busy business owner and frequent speaker, was soon to appear on a Cable TV interview show. She needed the right clothes, ones that fit the producer’s parameters, with no black or white or prints. We met at a local department store. I started an hour before our meeting, pulling dresses, jackets, and tops. She spent two hours in a comfortable dressing room trying the choices. We created a couple of perfect looks for the program and for an upcoming conference, as well as accumulating some basic pants and shells to get her through summer and into fall. We were able to get a great deal, accomplished efficiently, saving her time, money and energy.